The small village of Cambuskenneth lies directly to the east of Stirling itself. The village is enclosed within a broad loop in the River Forth and the only road in or out heads north for a mile before meeting the A907 near Stirling University and the Wallace Monument. A footbridge was constructed across the river in 1934 to link the village to the centre of Stirling, but Cambuskenneth still retains a slightly odd sense of close proximity to the city to its west, but almost complete separateness from it. It feels very much as if it is on an island. It was probably this same combination of convenience and seclusion that led King David I to found an abbey here in 1140. Originally known as the Abbey of St Mary or the Abbey of Stirling, Cambuskenneth Abbey rapidly gathered considerable wealth and influence because of its royal patronage and its links with Stirling Castle. It seems likely that a ferry operated across the River Forth where the footbridge was later built to allow links to be maintained between abbey and town without a significant detour to the north over what would have been boggy ground. 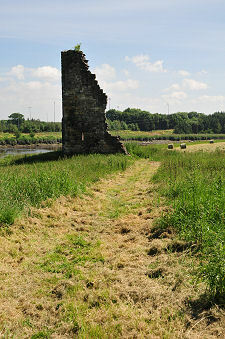 At its height at the end of the 1200s Cambuskenneth comprised an extensive complex of buildings. This included a large abbey church, some 60m long. To its south was the usual cloister surrounded by ranges of domestic buildings. Between the cloister and the river to its east stood secondary ranges of buildings and a wharf. 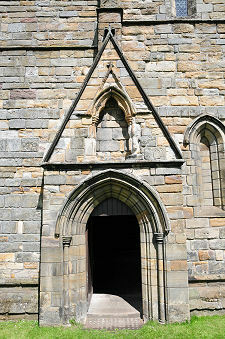 The canons who lived and worshipped at Cambuskenneth Abbey were initially members of the Arrouaisian Order, based in northern France. The abbey later came under the control of the much better known Augstinian Order. The canons' role was to pray for the soul of their patron, the King of Scotland, and his family. They also worked in the community beyond the confines of the abbey and undertook administrative roles in the royal court. Cambuskenneth's closeness to Stirling Castle gained it few favours from passing English armies during the Wars of Independence from the end of the 1200s. In 1314 King Robert I held a parliament at the abbey following his victory over the English at the nearby Battle of Bannockburn. Another parliament held here in 1326 agreed the line of royal succession that would in 1371 place the first of the Stewart dynasty on the throne of Scotland. 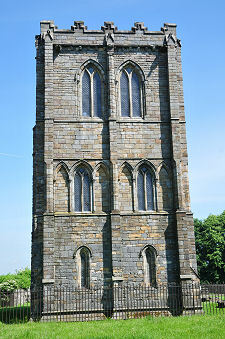 By 1383 the abbey was attacked and largely destroyed by the army of King Richard II of England. It was rebuilt during the early 1400s and once again used by Scotland's royalty while in residence at Stirling Castle. On 11 June 1488 the nearby Battle of Sauchie took place between James III's army and supporters of his 15 year old son, James, Duke of Rothesay (see our Historical Timeline). James III fled before the battle commenced, and he was subsequently murdered by an unknown hand. 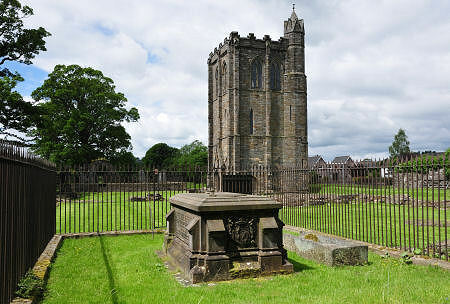 His body was brought to Cambuskenneth Abbey and he was buried in front of the high altar of the abbey church, alongside his Queen, Margaret of Denmark, who had died in 1486. Today their last resting place is marked by a fine tomb surrounded by railings, with views that include the Wallace Monument to the north and Stirling Castle to the west. But now the abbey church and most of the abbey has gone, this seems a slightly sad and incongruous burial place for a king, even for one of Scotland's more unpopular kings. The tomb you see today was paid for by Queen Victoria following the discovery of two coffins under the site of the high altar during restoration in 1865 that were believed to contain the remains of the royal couple. After the Reformation the abbey became a quarry for stone reused in various parts of Stirling itself, and in particular in the building of Mar's Wark, a mansion close to Stirling Castle. Apart from the bell tower which still stands today, very little was left by the time the site was excavated by William Mackison, the Stirling Burgh Architect, in 1864. 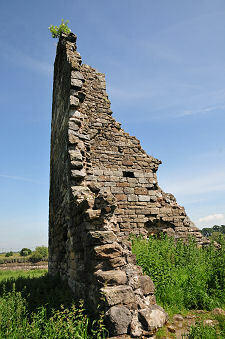 The tower probably survived as a valuable lookout over the extensive flatlands in the valley of the River Forth. Today's visitor finds an intriguing site comprising a number of very different elements. Access is beyond a cattle grid at the end of the road through the village and across a field sometimes used for grazing cattle. Parking arrangements are unclear: we've found it best to park on the street, while avoiding residents' drives. As already noted, the only standing building is the abbey's bell tower, probably built in the 1300s, and heavily restored in the 1860s. Nearby is a small burial gound. 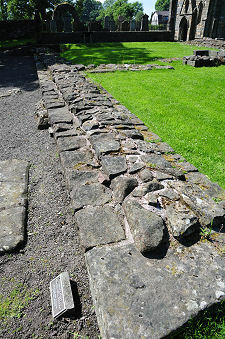 The rest of the abbey's main complex, including the abbey church and cloister, is visible only from stone courses on the ground showing the tops of the foundations. 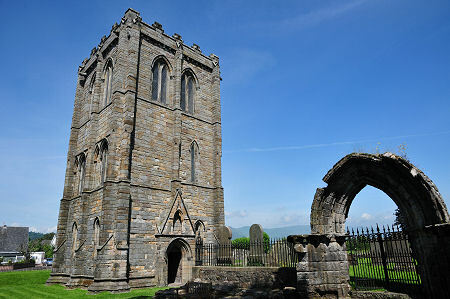 The enclosure and the tomb of James III and Margaret of Denmark comprise the third aspect of today's Cambuskenneth Abbey. But perhaps the most interesting part of any visit to the abbey is the least obvious. Beyond the railed enclosure surrounding the main abbey complex are more remains and ruins in the rough pasture leading down to the side of the tidal River Forth. These seem to correspond to the secondary ranges of buildings shown on the information boards on the site, and if so give a very rare opportunity to explore parts of an abbey ruin "in the wild". It isn't at all clear why stonework was left above ground in this area following the Reformation: though perhaps the area's rather spooky reputation might hold at least a partial answer. In the village of Cambuskenneth, to the east of Stirling.